The International Tribunal on Evictions has urged authorities to stop evictions in Panama village and to return land to displaced people immediately. They also called for the military to get out and cease commercial activities. Special attention was given to the case of Panaama village, Sri Lanka, where 1,400 people were violently evicted in 2010. On their lands, the Sri Lankan Navy built a hotel, the Malima Lagoone Cabanas, while the Air Force is building the International Relations Centre. 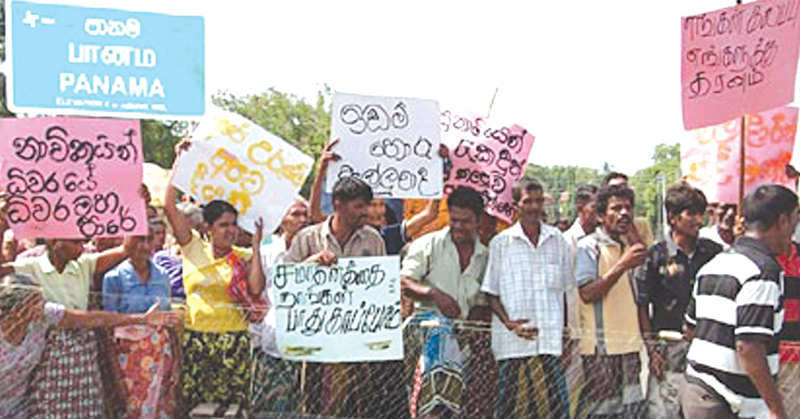 The villagers, peasants and fishermen who were evicted are struggling to recover the confiscated land, but so far they have not obtained justice. The ITE Jury, composed of concerned experts and representatives from international and local organisations specialising in human rights and tourism in a press release stated that it has proven the evidence that tourism development that puts profits before local communities and their well-being, leads to violations of national laws and human rights legally recognised by the countries that have ratified the International Covenants. Analysis of the cases had showed that the loss of local residents’ shelter, housing and land, as well as loss of access to resources upon which their livelihood depends upon, triggered additional human right violations. The case of Panaama Village highlights a clear lack of Free, Prior and Informed Consent and meaningful consultation of the local community with regards to tourism development and land right issues resulting in violations of national and international regulations, they further stated.